1001 Inventions has developed a variety of educational materials to support teachers in their classroom in a fun and engaging manner. Our books, teachers’ guides, activity sheets and learning games aim to spark interest in science while promoting intercultural dialogue, social cohesion and mutual respect. We invite you to browse through our educational products. Our ultimate objective is simple, to have the 1001 Inventions educational materials used in every school and educational institution all around the world! The latest edition of the best-selling 1001 Inventions book introduces the enduring legacy of Muslim civilization to new audiences around the world. The previous two editions of the flagship 1001 Inventions publication sold more than 200,000 copies, with Turkish and Arabic versions also proving very popular. The book's seven chapters are richly illustrated and provide insight into the everyday life of early Muslim civilization and the related and subsequent growth and progress of Western civilization. There is also an extensive reference section, a glossary of subjects and people, charts, timelines and maps illustrating the inventions and contributions, remarkable photographs, artifacts, historic documents and drawings. The book produced in partnership with National Geographic for ages 8-12 uses the winning formula of facts, photos and fun. Each page is packed with information on little-known history of Muslim civilization, showing how their achievements still apply to our world today. From 1001 Inventions and National Geographic Kids, the book provides accessible, yet wide-ranging, information for independent readers. The book is a special tribute to the 11th century pioneering scientific thinker Al-Hasan Ibn al-Haytham (known in the West by the Latinized form of his first name “Alhazen”). It is a companion to the international educational campaign, "1001 Inventions and the World of Ibn al-Haytham," that includes interactive exhibits, workshops, live shows, and a 12-minute film starring Omar Sharif in his final film cinematic appearance. New ideas… solving real-world problems… collaborating creatively… these are all routes to success in science and development. Today’s scientists and engineers are building on strong foundations of innovation and knowledge-sharing. Behind some of the concepts and principles in modern maths and science are centuries of discovery and debate that began a thousand years ago in Muslim civilisation. The 1001 Inventions Education Pack aims to inspire the next generation to take up the challenge of improving daily life through science, engineering, innovation and creativity. It provides educators and students with materials for learning about science and culture in a fun and engaging way, while highlighting contributions by scholars and scientists from Muslim civilisation. Teacher’s Guide: designed for teachers and educators, this is full of information and activities to support classroom learning, with instructions and references. Build Your Own Exhibition Guide: designed to guide students and teachers through a collaborative school project to create their own 1001 Inventions show or exhibition. Includes trips, advice, information, scripts, suggested exhibits and fun educational activities. Exhibition Activity Sheets: designed for use by students during their visit to a 1001 Inventions exhibition near them, with separate sets for primary and secondary school children. A Children's Guide to the exhibition, this activity book brings to life the characters and inventions featured in 1001 Inventions. With amazing facts and fun quizzes on every area of discovery, this book features 33 pages of fascinating detail about Muslim civilisation. It also contains 5 brilliant projects to allow children to experiment and create, just like the famous inventors of the golden age. This guide book is a great way for schools to follow up an exhibition visit in lessons, or for parents and children to bring the wonder of the exhibition home. It will make a memorable addition to any bookshelf and remind younger visitors of this inspiring period of history. Educational resources on IbnAlhaytham.com include a range of hands-on workshops, activities and demonstrations offering insights into the history of light, vision and optics. IbnAlHaytham.com is part of “1001 Inventions and the World of Ibn Al-Haytham” global educational campaign organised in partnership with UNESCO to celebrate the United Nations proclaimed International Year of Light and honour the remarkable 11th Century scientist. A set of 10 high quality educational posters aimed for 11-16 year olds. A wonderful way to learn about Muslim Civilisation’s contribution to Science and brighten up the classroom! The short film starring Sir Ben Kingsley follows the story of three school children that visit a dusty library to research the story of 'The Dark Ages'. What they find changes their views on the world dramatically as ingenious inventors and pioneers of science and culture are vividly brought to life. The late legendary actor Omar Sharif takes the lead role in the short film that brings to life the story of Ibn al-Haytham’s quest to discover the nature of light and vision. The partly animated storyline is intertwined with a live-action backstory starring Sharif, who guides in the quest of discovering Ibn al-Haytham’s journey to understand how we see, and the principles of light and optical theories. 1001 Inventions produces a range of branded educational merchandise catering for a wide age range. 1001 Inventions products support and enhance the brand and the heritage it represents through educational gameplay and learning. Scientists, inventors, medics, engineers and mathematicians of all faiths and cultures across Muslim civilisation, worked together in harmony for the betterment of society and shaped the way we live today. 1001 Inventions celebrates these men and women, often referred to as ‘Heroes of the Golden Age’, as they are synonymous with the brand and heritage it represents. These characters each have an astounding story to tell about their lives, their accomplishments and their impact on our modern world. 1001 Inventions brings these characters to life through our films, books and blockbuster touring exhibitions. Animated versions of these historical characters are shown above. On October 27 2018, the Canadian Islamic Heritage Month was celebrated at the Vaughan City Hall in Ontario, Canada. The educational event included shows, workshops and presentations with many on the contribution to science from remarkable men and women during the golden age of science in Muslim civilisation. Children were dressed up in costumes of pioneers and performed theatrical sketches to audiences including their families and friends. 1001 Inventions educational resources and posters were used to produce many of the activities by the local communities. The ‘1001 Inventions and the Library of Secrets’ film starring Sir Ben Kingsley and ‘1001 Inventions and the World of Ibn Al-Haytham’ film starring the legendary actor Omar Sharif were both enjoyed by visitors. Children also organised exhibitions following ‘1001 Inventions Build Your Own Exhibition Guide’ and participated in a variety of hands-on activities and demonstrations. Students from Bloomfield Hills High School in costumes of pioneers from Muslim Civilisation engaging children and families with 1001 Inventions hands-on workshops and educational material. Participation organised by Friends of 1001 Inventions Michigan. 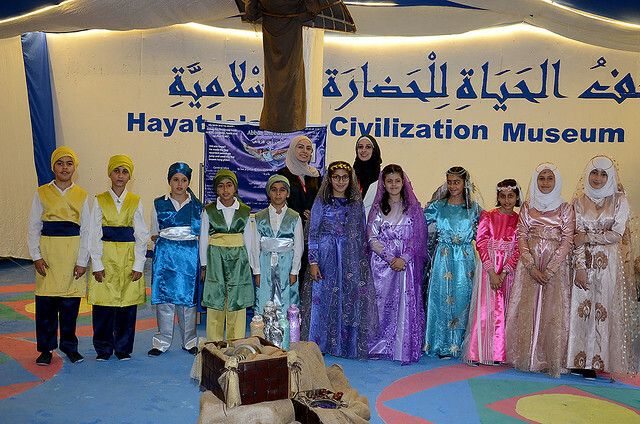 Organised by fifth grade students at Al-Hayat international school having been encouraged and influenced by the 1001 Inventions books and website. لو كنت طالبا مجتهدا قبل 1200 عام ونجحت في الإمتحان وقررت أن تلتحق بأول وأفضل جامعة ذي ذاك الوقت .. فأي جامعة ستختار .؟! تعرّف على فاطمة الفهري .. التي بنت أول جامعة في التاريخ ..
Organisations, corporates and philanthropists can sponsor the purchase and distribution of 1001 Inventions books and educational materials to schools, colleges and universities. If interested please contact us.